Sketchnote Hangout offers attendees an opportunity to discuss and practice sketchnoting within a peaceful, respectful, fun and friendly environment. 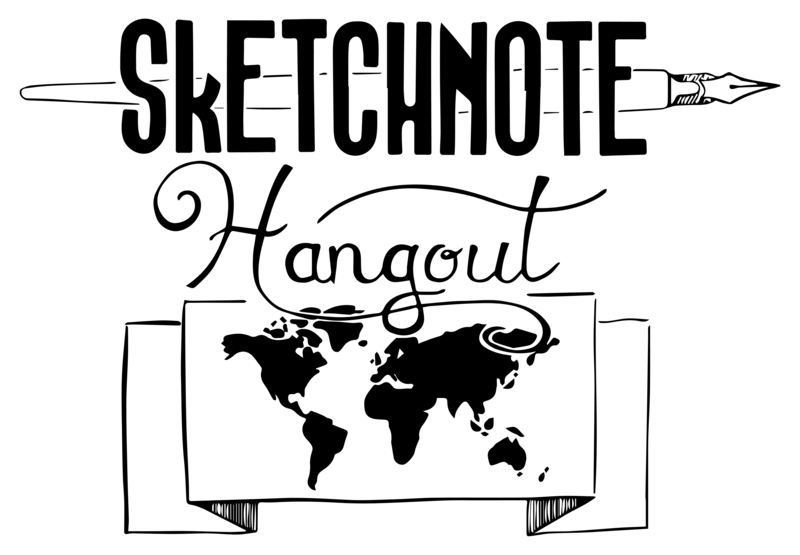 It is with great pleasure to introduce Sketchnote Hangout community regulars. I follow and participate in SNHangout since the first time “Sketchnote Hangout #1: Connectors and Separators” and I’m honored I’ve been invited as a facilitator more than one time: every single time was awesome! Both as a participant or facilitator. I’m not talking just about fun, I’m talking about a whole International and practical experience, where you can see very talented people speaking live about a topic, ask questions and share your “take home” with a like-minded group. Each SN Hangout became a milestone in my lifelong learning path. Every SNHangout is a unique experience and each one deserve a gloriuos sketchnote. I selected Mario’s event because of feeling I had. I know Mario in person, I love his abilities and passion and most of what he said resonate deeply in my soul. Like Mauro, I was part of the very first Sketchnote Hangout and since, I try to participate as often as I can. Sketchnote Hangout is a friendly place where Sharing is The Rule. I had the opportunity and the luck to animate one of them. It was a terrific experience! As participant, each SN Hangout is the occasion to find out new sketchnoters, but also new technics, sources of inspiration and feedbacks from all around the world thanks to her cosmopolitan and welcoming community always ready to help and support. I’m really proud to be part of it. Location: ST Germain En Laye, France Like Mauro, I was part of the very first Sketchnote Hangout and since, I try to participate as often as I can. Sketchnote Hangout is a friendly place where Sharing is The Rule. I had the opportunity and the luck to animate one of them. It was a terrific experience! As participant, each SN Hangout is the occasion to find out new sketchnoters, but also new technics, sources of inspiration and feedbacks from all around the world thanks to her cosmopolitan and welcoming community always ready to help and support. I’m really proud to be part of it. I use sketchnote as an everyday tool, taking all my professional and personnal notes in this format. It totally transformed the way I apprehend the informations, how I store it in my brain and in my sketchbook instead of an hard drive or in the cloud. I learned a lot from the @SN_Hangout I have attended and I have found confidence in the community. Sketchnoting has changed both the way I look at the word and the way I listen for information. The everyday shapes that make up life help me ‘sketch’ anything that I can see and listening intently for big ideas and patterns both in lecture and discussion is invaluable to me as I build knowledge. The Sketchnote Hangout community has encouraged me to continue learning and sharing in a supportive, collaborative and generous environment. I use sketchnotes to improve my ability to tell visual stories in my work with startups and entrepreneurs. As a non-artist, SN hangout has been great for my confidence because everyone is very supportive and I love learning from the diverse SN hangout community. Some people are very talented having drawn for most of their life, while others are more like me yet have succeeded in producing wondrous visualizations seemingly through sheer willpower – giving me hope as I continue on my learning journey. SN hangout with the great cartoon artist and illustrator Sydney Padua taught me new ways to look at both my sketchnote composition process and workflow. SN Hangout always provides opportunities for me to try new vizualization techniques. A couple of years ago I saw a sketchnote completed by one of my colleagues and my initial thought was “Wow! I am never going to be able to do that”. A year or so later I decided to be brave and explore sketchnotes. I read everything I could find and started looking at the work of others.) Sketchnotes are a constant part of my own practice as a teacher and part-time student working towards my MA in Education. They help me to think more critically and help others gain an understanding of my thought process. My passion for sketchnotes is something that I love to share and many of my colleagues and students are embracing sketchnotes in their own lives. Role of sketchnotes in my life: Sketchnotes are my go-to way for capturing talks or ideas of others as well as my own thoughts, and sharing what I’ve learned with friends and colleagues. For me they are a great way of organising information and help me to check whether I’ve really understood something I’m noting down. They’ve also introduced me to many awesome people with awesome ideas on what else you can use sketchnotes for – and I love how open and ready to teach others that community is (the Sketchnote Hangout leading the way :)). I was so impressed by how versatile sketchnotes can be and the positive effects sketchnoting can have – for example when studying or teaching! I bumped into Sketchnotes in late 2014 and it instantly changed my life. I always loved pens and notebooks, but Sketchnotes became the catalyst that allowed me to produce notes I read over and over again. Amazingly, I found that there are many people in the world who also love reading those notes! I rely on the SN Hangout community for support and growth the way a seed relies on fertile soil. Sketchnotes from Aurora Melchor’s brilliant SN Hangout presentation about using comics for sketchnoting. This was one of my favorite SN Hangouts! I have been a visual notetaker since my college years back in the late 90’s… but it wasn’t until I heard about sketchnotes 5 years ago that it was a “thing.” Sketchnotes play a large role in my career as a design educator. Ever problem I solve is thought out on paper whether it’s a class project I’m developing, a client project I’m doing, or a meeting I’m taking notes for. The Sketchnote Hangout has had two major benefits for me: 1) opening my eyes to the diversity of what sketchnotes can be used for and 2) the international community of sketchnoters that I interact with on a dailay basis. Sketchnote Hangout #17: Co-creating Sketchnote Cheat Sheets – I really loved the challenge of quickly sketching the icons for the words and ideas tthown at us. Exercises like this sharpen my mind and my skills. As a graphic design educator, I long for the simplicity of recognizing and communicating these ideas. It was a fabulous hour and enjoyed seeing the work of the other community members and the many different versions of their icons. A true collaboration! I discovered SNHangout late in 2016 and I suddenly become addicted to it. I once had the honor to present my sketches to others and it helped me a lot to focus on the reasons why I embraced sketchnoting as a tool to improve my personal productivity and to record my private life moments, such as summer holidays and travels. But, most important, every SNHangout is an opportunity to learn and see something new from a great Community of very talented people, who love to share their works and their experience. Never having heard of sketchnotes until SNday 2016, but being often busy on paper or the ipad, this was an eye-opener for me. Drawing to convey information! The sketchnote community is a very inspiring group to be part of, and in particular, the Hangouts with the live interaction. Always curious to learn new approaches to drawing and lettering, the hangouts have awakened me to new challenges. The drawings posted by others given the same task and to see how they interprete it, is interesting. . Drawing ‘live’ was very scary the first time. BTW, I hate the story cubes, sorry, but enjoy the warming-up speed-drawing words. I’m not a sketchnoter, but since learning about SN’s, I enjoy drawing in info-graphic style. The SN Hangout #26 given by Doug Neill intrigued me. I had no clue as to how to film a drawing process. SO many things to take into consideration. I think I tweeted that ‘this is a whole new ball game”, so I’ll just stick to the drawing. That’s challenging enough. I did draw this SN first in pencil and then penned it.